Why are floors designed specifically for dance important? Like any physical other activity, dance carries with it some inherent risk of injury. For professional dancers, an injury can mean the difference between being able to work or losing income. In extreme cases an injury can cut short a career and render a dancer unable to perform for the rest of their life. There are two main factors that contribute to potential injury for dancers. 1) Technique – Learning proper technique specific to the type of dance being studied is critical to avoiding injury. Without it, a dancer may attempt to execute a move improperly or try something their bodies are not ready for. 2) Dance Surface – An improperly designed or installed dance floor will not have the correct characteristics to help prevent injury. Without the proper resilience (or give) the energy of a dancer’s foot striking the floor will either a) rebound off the surface and travel back through the body as a shockwave (if the surface is hard like concrete) causing joint trauma or b) be absorbed too much, exposing the dancer to muscle and tendon injury as they try to overcome the dampening effect of the floor. The solution is a professional dance floor from one of the handful of companies who specialize in such things. 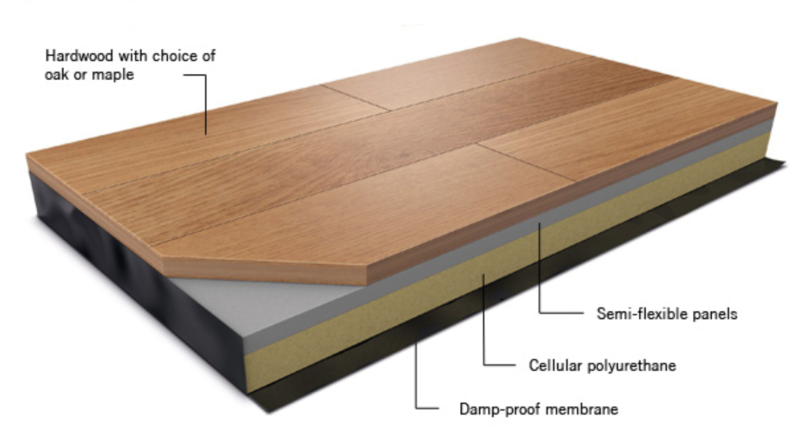 These floors are usually some combination of engineered sub flooring offering optimum resilience for the types of dance in question with a top layer of specially manufactured flooring designed to provide optimum lateral stability (not to sticky, not too smooth). Although expensive to install and maintain, they are critical to safe dance. Our studios at Elegant Dance Studio use dance floors installed with a “sprung” sub floor over concrete. These sub floors sit on literally thousands of foam cubes and provide the optimum in stability and resiliency for all forms of dance taught at Spotlight. When considering a studio for yourself or your child we strongly recommend that you ask whether the studio has a professional dance floor or not. Dancing on a “Marley” floor is not enough, especially if that floor is installed directly over concrete. According to Sports Medicine experts, the body feels three times its weight in pressure with each foot-fall while running and up to seven times its weight when it jumps. Jumping on a non-floating floor can result in shin splints, sprains or much worse.